The sella turcica is structurally a cup-shaped recession which is located in the central basisphenoid bone that encloses the pituitary gland along with inferior portion of the infundibular stalk. The sellar floor is anteriorly constant with the tuberculum sellae and the dorsum sellae posteriorly. The anterior wall of the sella is situated perpendicularly at the posterior margin of the chiasmatic sulcus along with its superior point noticeable as a slight elevation referred to as the tuberculum sellae. Lateral projections from the corners of the tuberculum sellae are prominent sometimes which are also known as the middle clinoid processes. The posterior wall of the sella turcica is the dorsum sellae, a large rim of bone protruding upward as well as forward. The lateral edges have curved projections referred to as the posterior clinoid processes above this bony ridge, which are sites of attachment for the tentorium cerebelli. The diaphragma sellae splits the sella turcica and the suprasellar subarachnoid space. This space contains the optic nerves as well as chiasm along with the upper portion of the infundibular stalk and is bounded by the circle of Willis. The hypothalamus and anterior third ventricular recess is located just over the infundibular stalk. Cranial nerves III, IV, and VI. The ophthalmic (VI) and maxillary (V2) divisions of the trigeminal nerve. 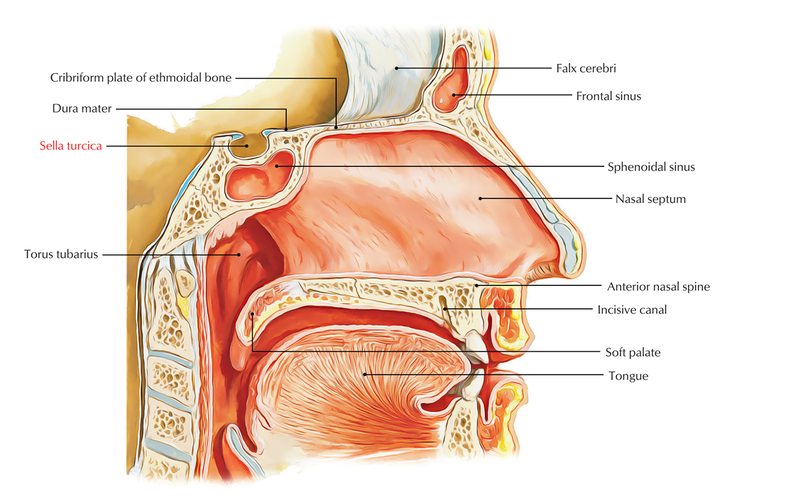 The sphenoid sinus is located under the sella. Craniopharyngioma is an embryonal tumor arising from squamous epithelial residue of Rathke’s pouch causing sellar swelling as well as destruction of variable amount, frequently spreads inside the pituitary fossa. The typical craniopharyngioma is a cystic mass having a mural nodule, which often comprises of calcifications. 3-5% of all primary intracranial brain tumors made up of Craniopharyngiomas and is the most common nonglial brain tumor within children. Over 50% of craniopharyngiomas arise in children, with a peak in the middle of 8 and 12 years of age. A second peak arises in middle-aged adults. Enlargement of the sella turcica may arise because of a slow-rising intrasellar bulk or an extension of the meningeal space inside the pituitary fossa via the diaphragm sellae or it can be a reaction to pituitary hyperplasia.